Looking back at 2011, no one would have predicted the rise of content that lasts for just 24 hours, so-called ephemeral content. When it first appeared as the main feature of Snapchat, it was popular only among teens. Things have changed a lot since then, and ephemeral content has taken the internet by storm. Ephemeral content is simply any visual content, video or photo, with a limited lifespan, and it’s become a white-hot marketing medium. After Snapchat, Facebook and Instagram jumped on the bandwagon to astonishing results, especially for the latter. For marketers, it has become a unique and powerful way to reach target audiences. But is it worth putting in the hard work if this stuff vanishes after 24 hours? Absolutely. In the following, I’ll not only explain why this content is so effective, but also walk through some of the best ways you can use it to build a stronger connection with your audience and increase your sales. Most content marketers love to focus on evergreen content, the kind that never has to go away. It can provide both old and new readers with valuable insights, it drives traffic, builds authority, and generates more leads and sales. All in all, evergreen content has a huge payoff. From that standpoint, creating ephemeral content can seem like a waste of time and effort. But consider that Instagram stories are growing 15X faster than feeds. For a variety of reasons, ephemeral content creates higher stickiness and engagement. It’s authentic: This type of content is about showing off real-time events, so it humanizes brands and allows them to be more genuine. It creates a sense of urgency: Since ephemeral content on Instagram is accessible for a brief period (24 hours), it ramps up a fear of missing out (FOMO). Thus, audiences take fast action and marketers gain from it. It grabs attention: In most cases, ephemeral content appears in a separate feed, and users can see whether they have watched it or not. Thus, it attracts attention and helps to beat the feed algorithms. Believe it or not, ephemeral content on Instagram is the best way to catch your audience’s attention. Instagram rolled out its stories feature in 2016, and over the past two years, it’s gained tremendous popularity among users. The company has built on that success with the introduction of live-streaming videos, and most recently, longer video content through IGTV. All in all, it seems Instagrammers are more likely to interact and share content in engaging and playful ways with the help of ephemeral content. It’s a great opportunity for brands to connect with customers where they’re already engaged and drive more sales. Here’s how to increase ecommerce sales with ephemeral content on Instagram. The most common type of Instagram time-sensitive content is stories. Since these posts appear in a separate feed, and every user decides whether he wants to watch your stories or not, it’s a great way to share information without clogging the main feed up with content. It’s no wonder many big companies like GAP, ASOS, and Sephora create Instagram stories. Not only does it entertain followers in an unique way, but it also helps brands increase sales. With over 1 billion active users, Instagram has huge potential for marketers to reach their target audiences. Most marketers will agree that sending your followers to a landing page is a chance to tell them more about the product or service, and therefore convert them into buyers. While most people add bio links to let their followers learn more about the brand, just a few followers usually click on them. Another option to drive traffic is Instagram ads. However, that can be pricey for some marketers. As a result, searching for alternative options is a must. Instagram allows marketers to add a URL to your Instagram stories if you have a business account with 10,000+ following. When you create a story, you can add the linked web page, which will appear as the phrase “See More”. Followers can swipe up to visit the site without leaving the app. For example, Lululemon adds website pages to show followers all available options without overposting. The good news? There’s no need to show off every product—you can just use links to lead Instagram followers to your web page, which can then offer a variety of products. Don’t be upset if you don’t have the right number of Instagram followers. You can always turn to influencers with big followings to collaborate with them and add a link to your product in their stories. It’s a way to enter an already-established community and make the most out of Instagram links, so you can get more traffic with Instagram influencers. Want to Learn How to Get 500K+ Instagram Followers in Under 12 Months? Sign Up For Our Free Masterclass. Learn How to Go From 0-500K+ Followers in 12 Months! Join our FREE Instagram Masterclass! To increase sales, you need to simplify the buying process for customers. The checkout process shouldn’t take too long, so it’s important to let your potential customers buy products without leaving the app. To make this easier, check out a new feature—shoppable Instagram stories stickers. It allows business profiles to tag physical products in their stories so that followers can learn more and make a purchase without wasting any time. If you’re interested in creating Instagram stories that sell, pay attention to GAP. Every time they feature a product in the brand’s story, they tag items and link to the web page so that interested users can click on the shopping bag icon and get more details. This provides followers with a better shopping experience within the app. From discovery to making a purchase, it’s easier for Instagrammers to buy their favorite products. And for marketers, it means driving ecommerce sales. If your products or services meet customers’ expectations, you’re far more likely to secure new and repeat buyers. That means brands should keep a clear focus on customer satisfaction, and there’s no better way to do so than listening to their thoughts. Believe it or not, using poll stickers is a great way to interact with your followers, and can be a funny and interesting way to increase customer satisfaction. Here’s a case study of this strategy in action by Sephora. To understand their customers better, Sephora encourages followers to vote for their choice. For users, it’s a way to share their preferences and a chance to be heard. And for marketers, it’s a way to collect customer feedback and learn what followers prefer. For example, Sephora can use the results to put a new spin on an old product. To gauge interest, you can see how many people voted, on top of what option they chose. You can even contact people via direct message to send a promo code, thanking them for their support or offering a collaboration—you understand more about their choice, and they can get a bonus from you in return. Wouldn’t it be great if you could add longevity to your ephemeral content? Actually, you can save and keep stories for more than 24 hours under your bio section with the Stories Highlights feature. It’s a great way to choose the best stories and group them into separate highlights so that your followers can get quick access to the most important information without scrolling the main feed. Let’s take a look at ASOS. Once a new follower visits the profile, everything is available right under the bio section. Grouping stories into categories is a great way to simplify the navigation. From the latest news to style advice, ASOS followers can enjoy visual storytelling to learn more about the brand and its products. If you want to improve customer ecommerce experience, you need to put your followers first and think about the ways to make the customer journey easier. Use Instagram Stories Highlights for your business to keep all important information about your company and products in one place. One of the best things about live streaming is to show what is happening at the moment with your business, providing an opportunity for real-time user engagement. Moreover, live stream keeps audiences hooked, as users never know what’s going to happen next. All in all, live streaming helps to project authenticity, offer something unique, and draw active engagement. Need proof? Let’s take a look at a survey by Livestream & New York Magazine. It’s harsh but true: modern customers are fed up with artificial ads and they crave for authenticity. To gain followers’ trust, it’s important to build a deep connection with them, and acting in real time is a must. Many brands take users behind the scenes to show their processes, and allow followers to connect with other people, not brands. Just look at McDonald’s. The company is happy to introduce team members and show their love for them. So they broadcast events with a focus on their team to humanize the brand. What’s more important, they add information about the event and livestream to their stories so that followers can plan their time and join the broadcast. But wait—how does it help to sell more? Well, when you humanize your brand and prove your relationships with workers are genuine, you can gain customers’ trust. As a result, they are more likely to rely on your brand. Actually, there’s a big variety of potential behind-the-scenes content. If you stay creative, you can find alternative ways how to go live and introduce your business in the best way. No matter what your product is, you can expect many competitors in your niche. And to stand out from them, you need to ensure your customers understand everything they want to know about your product. There’s no better way to do it than answering their questions directly. While responding to comments is great, being proactive and organizing Q&A sessions is even better. If you want to help your potential customers understand your product better, go live to discuss their questions. Since followers can submit questions in real time, it helps them get a reply quicker and keeps them hooked. When it comes to livestreaming, Belletrist knows their followers value their time, so they announce broadcasts so that more people can join the sessions. When you go live, your followers usually type questions and the host will answer via video. Obviously, it’s better to invite a worker who knows the product/service inside out so that he will be able to answer all questions. Choose a host and a moderator. The host is a brand ambassador who knows your product inside out, and the moderator is a person who can direct the broadcast, read questions aloud, and control the camera. Predict questions your followers may ask and prepare the best answers. Since most brands have FAQs (frequently asked questions), you can expect to hear some of these questions while broadcasting. Moreover, if you have told your followers about a new product launch before the session, people will likely have questions about it (the date, the benefits, etc.). Promote your Q&A live session. Without an audience, going live is a waste of time. You need to tell your followers about the stream in advance to attract more viewers. Plus, when you announce your live stream, you can find a time that suits your followers best. If you wonder how often should you organize Q&A sessions, you’d better ask your followers as they know what they need best. Create a poll or encourage Instagrammers to share their thoughts in the comment section to understand whether it’s time to go live again. Once your followers fully understand your product, they can make the purchase decision faster. Check out this company that uses Live Q&A videos to bring in 150 new customers a month. When you promote your product, that’s great. When opinion leaders do it, that’s even better. Since modern customers don’t trust brands much, it’s important to show them that other influential people choose your brand and product. It’s a way to increase loyalty and access an already-established community. For example, Sephora partnered with Ami Desai to explain to their followers how to use their products, and it was a hit! If you want to earn trust and increase visibility, collaborating with a brand ambassador can be a good option for you. Moreover, the number of niche influencers is big, so you can find and collaborate with them to bring your business to the next level. Instagram influencer marketing is surging, which means Instagrammers are more likely to join the live stream when a star is featured. Being a smaller ecommerce brand, you can work with micro-influencers who will be more willing to work with you for free product or a small incentive. You can offer them cross promotion—you get genuine reviews and influencers have a chance to grow their following. Releasing a new product? Congrats! That means your company is growing. And if you want to expand your number of fans, share the good news with them on social media. Let’s take a look at fast food chain Shake Shack. Back to 2001, it started out as a hot dog cart in New York. Now, it’s one of the fastest-growing chains, operating 136 locations internationally. Every time the company plans to open a new restaurant, they inform their fans on social media and go live to show the new place. It’s no wonder Shake Shack fans are eager to know where they can find new locations of their favorite restaurant. When you go live to tell your followers about a launch, you make sure all your potential visitors know about a new offering. First things first: Instagram TV, or IGTV, isn’t technically ephemeral content. Like highlights, these longer videos live permanently on your bio page. However, many marketers believe IGTV generates the same fear of missing out as ephemeral content since the new IGTV icon appears between the main Instagram logo and the direct message icon on the news feed, right above Instagram Stories. When you publish a new video on IGTV, the icon will light up, and users get a notification. This prompts users to act quickly much like they do when they see you uploaded ephemeral content like an Instagram Story. For this reason, I thought it would be valuable to include IGTV In this article as it is a great way to attract more people to your brand. IGTV is a new app inside the main Instagram app for watching long-form (up to 60 minutes in length) video content. IGTV allows users to take their video strategy to the next level. It’s also a great fit for brands that plan to sell on Instagram. Moreover, the IGTV circle appears to the left of Story Highlights, right below your bio section. As a result, it’s nearly the first thing Instagrammers see when they visit your page, and it’s a powerful tool to tell more about your brand, products, and values in a funny and engaging way. Why bother? The vertical video content format is on the rise. While horizontal videos are considered the more widely accepted format (think YouTube), more and more people prefer vertical videos when it comes to watching content on their phones. In fact, we hold our phones vertically 94% of the time, so vertical videos are more comfortable for users. Since big companies like Instagram put their users first, it’s no wonder they embrace vertical content formats. As a result, Instagram rolled out the IGTV feature in June 2018, and it’s a huge Instagram trend. The best way to convince your followers to buy is to prove that it can solve their problems. When you sell the solutions, you get better results, and being an expert in your niche means you can share tutorial videos to explain how to make the most out of your product. Instagram has a 15-second limit for Instagram stories, and videos in the main feed can be up to 60 seconds. 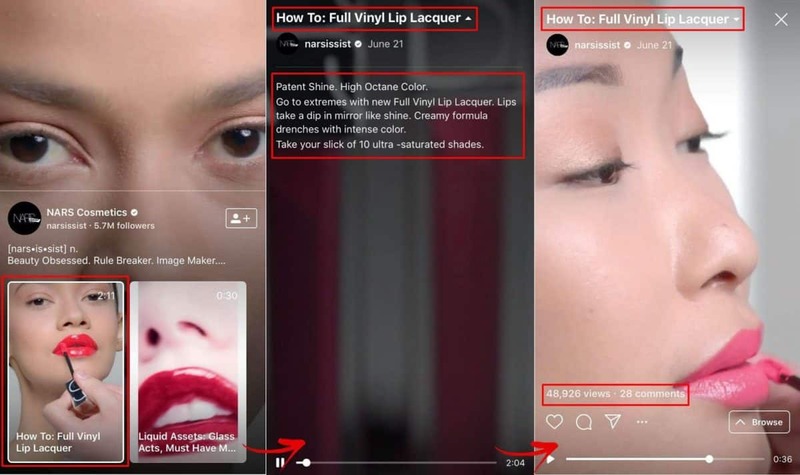 While that’s not enough to really educate your followers about a product, you can upload longer videos to your IGTV channel. With up to 60 minutes, you can include all the relevant information. NARS Cosmetics uploads tutorial videos to show their followers how to effectively use their products. Tutorials are aimed at providing users with informative and useful content, and they help brands build trust and loyalty. People will associate expert videos with your brand, and think about your expertise when making purchase decisions. If you’re a small business owner who wants to promote on Instagram, IGTV tutorials can help you as well. Just take a look at turkish coffee bar Coffeelso. They managed to provide followers with a low-tech, but informative video on how to brew coffee. You don’t have to be a big brand to share your experience and knowledge in your niche. While offline marketing helps to put your product in front of potential customers, online marketing helps to promote it to your target audience. Thus, integrating offline and online is a must. And when you plan to hold an offline event, you can use social media to tell your customers about the upcoming event in advance or record it to show the result to those people who weren’t able to visit it in real life. The good news? IGTV allows marketers to record offline events. Let’s take Loft, for example. They created a video to show off a pop-up original art wall by Chris Uphues. When you do something offline, just a limited group of locals can see it. When you show the results on social media, you allow potential customers to see your work. It helps to gain their trust and boost sales. It’s no secret that customers trust companies that can bring valuable information and educate their fans. Obviously, people can find information on the web these days, but when it’s you who educates them, you have an ace up your sleeve. Case in point: After analyzing the rise in popularity of the Azores destination, Airbnb decided to create a video featuring locals to explain why this place can be a great choice for travelers. For Airbnb users, it’s a great opportunity to understand more about a little-known place and take it into consideration when planning further trips. This video educates followers, and the company builds trust in their fans. The main idea is to provide followers with fresh and valuable content that shows new aspects of using your product. People want to connect with real people, not brands. Introduce your team to followers to humanize your brand and stay genuine. Modern customers value authenticity more than ever, and showing your team is one way to project it. With the help of IGTV, NASA allows followers to meet the crew online, whenever they want. After forming the crew for the first commercial spacecraft flight, NASA introduced the nine astronauts to Instagram followers. While NASA is a government agency and not a company, I wanted to include it here because the the organization makes the most out of IGTV. Use this example as inspiration for your own IGTV videos. For NASA, it was a chance to engage with the public and show off their team’s expertise. For followers, it was a way to understand more about the company’s values and priorities and start trusting them more. Even if you don’t have many team members, you can still humanize your brand and introduce yourself. People want to see who stands behind the product creation. The secret to selling with ephemeral content on Instagram is not about being salesy. The more authentic you are, the better. Even if you know how to create an Instagram copy that sells, don’t forget to keep an eye on current trends happening in ephemeral content, as it’s a prime platform to land more sales and make stronger connections. Are you ready to sell with ephemeral content? Let me know in the comments if you have had any success with Instagram stories, live streaming, or IGTV. Hugh Beaulac is a social media manager who helps businesses grow online. He keeps up with trends, so Hugh lays a bet on Instagram this year. He also runs MC2 Bid4Papers website and contributes to various websites as a guest blogger. Follow him on Twitter to stay tuned for more.